This picture was taken at the 2002 Nationals. He was wonderful! So bouncy and full of life. He truly enjoyed himself and it is always nice to see a horse his age in such good shape. Also on this site is his sister Nostalgia and her son Nord. Nimbusz is a very good breeding stallion and is the sire of the stallions Granit exp UK, Gard, Carat and Chock as well as many mares. Nimbusz comes from the dam line of Mlecha OA, from a Kuhailan strain, who was imported to Jarczowce in 1845. This family has produced a number of great stallions as well as good mares. The family has two major branches, through Lysa 1915 and Fanfara 1914. The branch that Nimbusz belongs to descends from Fanfara through her daughter Unaiza 1928. The family was imported by the prominent breeder S-B Uhlén in 1965 when he imported Cisawica (Sedziwoj x *Cissa), a greatgranddaughter of Unaiza, who was in foal to Gwarny. Cisawica was half sister to the stallions *Cytrys and *Cypr. She was the dam of the mares Nidshem (the in utero import), Cienka, *Ciotka and Charmia and the stallion Cien. Nidshem 1966 was one of the most sucessful mares in Sweden. 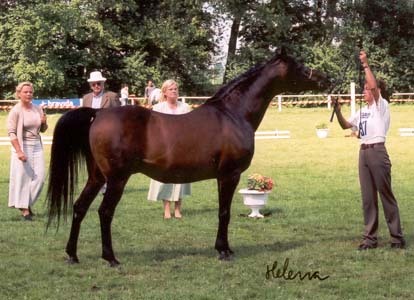 A show champion herself, twice Swedish Nat'l Ch mare, she has produced Nimbusz, twice Swedish Nat'l Junior Ch Stallion and several of her descendants has been Nat'l and Reserve Nat'l champions. Nidshem was the dam of the mares Nostalgia, Nizina, *Ninotchka, Nianka, Nominacja, Niebiosa and Nastrojowa and stallions Nimbusz, *Napad, *Nabytek, Nior and Nipr.